Crossbreed SuperTuck Holsters. Positioned on top of our price scale, this model from renowned weapon accessory manufacturer, Crossbreed, is the most expensive in our brood of 3. 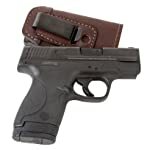 However, the quality of design and the full-packed features of the holster make it worth every dollar you spent. 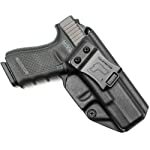 Tulster Profile IWB Holster. More affordable compared to its Crossbreed SuperTuck counterpart, the IWB holster by Tulster is great value for your money. The mid-range Glock 23 conceal carry accessory received a high customer approval due to its reliability and overall performance, given its advanced technology designs. Alien Gear Holsters Tuck 3.0. The most affordable yet highly preferred holster model on our list is the Tuck 3.0 from Alien Gear Holsters. Aside from the affordable price, the accessory also showcases some designs that the Crossbreed and Tulster holsters do not have, including the Iron-Clad Triple Guarantee to ensure its long-lasting design. One of the most crucial features of a Glock 23 holster with IWB design is its capacity to last for a longer period of time especially in the harshest and most demanding of conditions. Durable and resilient properties are also the things you need to look for in other weapon accessories such as your holster for Glock 17. Tulster Profile IWB Holster. The material used for the construction of the IWB holster from Tulster is carbon fiber that is still made from Kydex. It showcases the thermo-forming materials with patterned boltaron, giving it a fantastic finish. The overall design and quality of the holster are formidable and durable, lasting for several years of use. Alien Gear Holsters Tuck 3.0. The Iron-Clad Triple Guarantee feature of this Glock 23 Inside the Waistband holster is what makes it significantly different than its Tulster Profile IWB holster counterpart. The product comes with a 30-day test drive with free shell trades and the Forever Warranty so that you get free lifetime replacement or repair for valid defects. Crossbreed SuperTuck Holsters. The SuperTuck deluxe holster is the flagship of the Crossbreed brand, making it a premium quality item. It has a totally different design compared to our Alien Gear and Tulster selections particularly the holster’s premium leather backing and molded Kydex pocket for versatility and durability in one. Whether it is a holster for Glock 27 or Glock 23, the best Inside the Waistband holster should be user-friendly, not giving you any hard time using and wearing your concealed carry. The unique designs of our top 3 picks give them different scores when it comes to the product’s simplicity for hassle-free use. Crossbreed SuperTuck Holsters. The versatile design of the profile holster makes it comfortably wearable with or without your shirt tucked in, depending on your personal preference and carry style. The cowhide leather holster in black is custom-designed to suit different Glock versions and generations with its highly concealable lightweight and easy to maneuver design. Alien Gear Holsters Tuck 3.0. The fully concealable gun holster offers an unparalleled level of comfort and easy to use design so that you would not have any problems in accessing your weapon on the field. The holster is a new edition from the Alien Gear collection, offering enhanced flexibility with guaranteed years of use without breakage, something that the SuperTuck Crossbreed holster does not have. Tulster Profile IWB Holster. The Inside the Waistband holster by Tulster is a minimalistic and ultra-concealable accessory that allow for easy and hassle-free magazine release even if the firearm is still fully holstered. The Crossbreed and Alien Gear selections do not have the model’s trigger guard undercut design in order to allow higher firearm grip. Choose an IWB holster for Glock 23 pistols that is easy to adjust for convenience and snug fit results. Holster designs may differ and could affect how the accessory can be worn or work with your weapon for concealed carry purposes. Tulster Profile IWB Holster. The model is conveniently adjustable from 0-15 degrees. It also offers the soft loop option and injection molded belt clip to customize how you want the holster positioned. Alien Gear Holsters Tuck 3.0. The concealed carry holster highlights the materials of the accessory that provides added retention through its sturdy stainless steel backbone. The belt clip variations and multiple shells housing let users swap their guns without changing the holster base. Crossbreed SuperTuck Holsters. Different versions of Glock pistols can suit this IWB holster through its superior adjustability feature, letting your gun snug fit inside the molded Kydex. The modular steel belt clips with powder coated design and the patented SnapLok technology allow you to adjust the cant and ride height. Inside the Waistband holsters are important accessories if you need or prefer to conceal carry your weapon. Holsters are not created equal and the IWB design is a fully loaded and overwhelming niche to look into. Thus, if you are shopping for a new IWB holster that suits your Glock 23 weapon, you need to carefully and closely look into each and every model available. The right and sound choice should both give you quality and affordability while making sure that the product is user-friendly and easy to adjust. There are numerous models and brands of IWB holsters but only a few tops the chart for quality and cost efficiency in one. 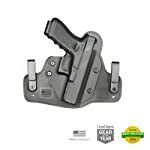 Based on our reviews and criteria, we strongly recommend the best IWB holster for Glock 23, Alien Gear Holsters Tuck 3.0. This is an extremely durable and long-lasting IWB holster with a Lifetime Warranty and Iron-Clad Triple Guarantee. Most importantly, the top-of-the-line holster comes with a remarkably affordable price that gives you real value for your money.